February 1 in Make It So! With the 7.0.9 revamp, the game no longer displays how many chronitons we have when we've completed a mission. It's highly inconvenient to go back and forth between exiting the mission complete screen to confirm how many chronitons there still are, then go back in to run another mission. I actually recently depleted my chronitons by pre-farming because I lost track and was certain there was no way I was going to go through 2000 chronitons with a supply kit. I couldn't find anywhere better to ask this question, but it has been nagging me. 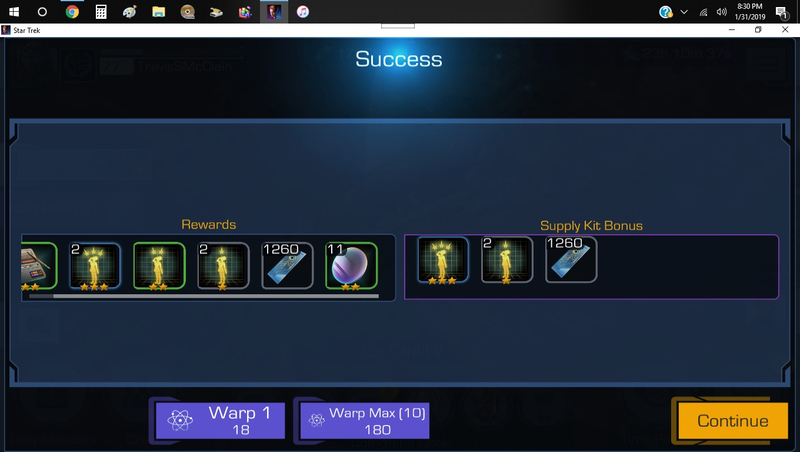 On voyages, I sometimes get a three star or even a five star set of chronitons. What's the difference between 30 chronitons and 30 five star chronitons? There isn’t one, sadly. It’s a display quirk that has been low on the list of bugs to fix for a while now. You can also observe this behavior in a couple of other places where chrons or event VP drop, as they do not have a particular rarity.